Normally the way a Holga works, you press down the button, it takes the picture. Period, the end. But if you want to do something a little tricker in terms of pressing and releasing, it’s a good idea to get a shutter release cable. The device is quite straightforward. You slide a black square over the front of your Holga lens. This wholly surrounds the regular switch you press to take the photo. There is now a cable pointing to that lever. At the far end of the cable is a push-plunger. When you push in the plunger, it pushes the cable down which presses the button for you. What this does is let you take the photo with a minimum of finger press and shake. 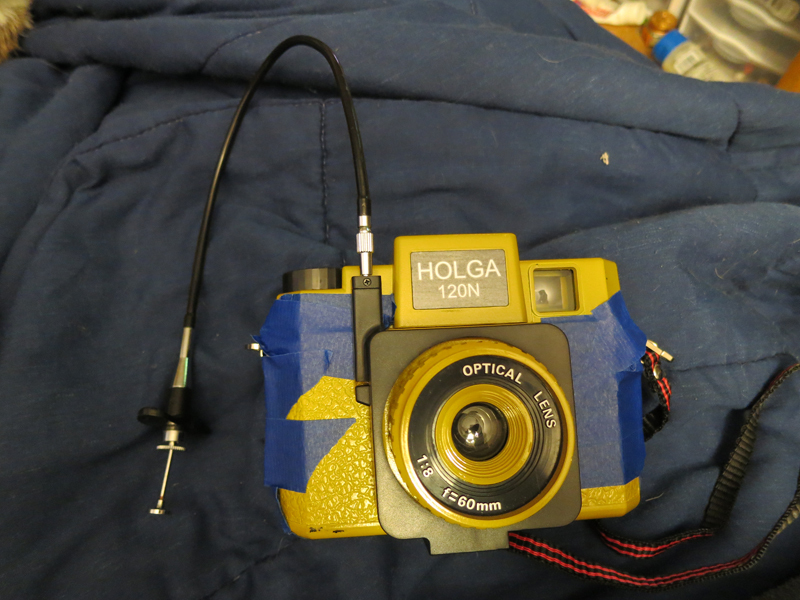 Now, if you mount your Holga to a tripod, you can get the image set. You can set the shutter to “bulb” mode which means the shutter will stay open while the lever is pressed down. Then you take the photo using that shutter release. It minimizes the camera movement as the lever goes down and then up again. If you’re doing any long exposure photography, I highly recommend buying a shutter release. They’re quite inexpensive and quite useful. This image was done with a shutter release in a dark nightclub.